“Ad Libitum”, affordable even for small/medium factory and to collect an initial cost certainly. The daily food like bread of the big demand fluctuation is suffered from the poor production efficiency. The long life foods and the big industry foods in the seasonal fluctuation are produced inefficiently in order to prevent over and less stock. “Ad libitum” has been developed, which is able to be introduced with a low cost, so as to avoid such a problem and make the rational production schedule not to cause to excessive stock without hand waiting, hand vacancy. It is possible to make an optimal “Ad libitum” with an order maid for an every factory. It is corresponding to LAN.. Correspondence in a hand-made factory “Ad Libitum” is corresponding to the factory where equipped with the batch oven such as the French oven. 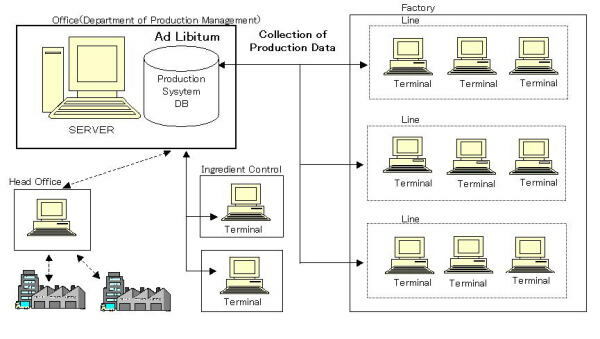 Technova's "Ad Libitum" shows the precise Production Schedule which is planed based on each production condition of product immediately after in putting the production order. "The visualizing factory" by Gant Chart and Histogram and so on, helps to get the situation in perspective plainly the　factory condition and problems. 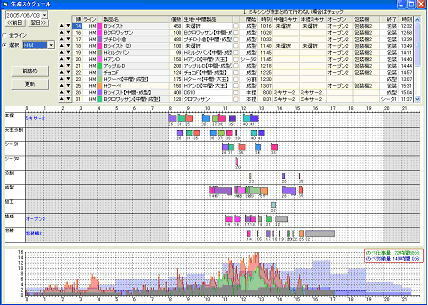 Productivity will be improved easily by changing production order (sequence), selection production resources by watching the display of "ad libitum". 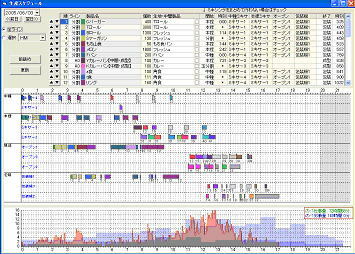 Good labor efficient Schedule is made by the production order, which is determined, adjusting the relation of worker supply (purple), whole job volume (pink) and line job volume (green). When you change the production order of products, you can recognize changing time length of the make span (the time length from start to finish of production). Therefore you can make a shorter production schedule of make span easily controlling a necessity of labor volume. It makes an obvious improvement of the productivity of factory. During making production schedule, watching not only whole factory screen but also each production line makes better efficient production. Ad libitum realize the visualizing factory also visualizing job and labor. A necessary worker number changes during production in the multiple kind productions. In the case of the multiple lines the worker total number fluctuates more largely. 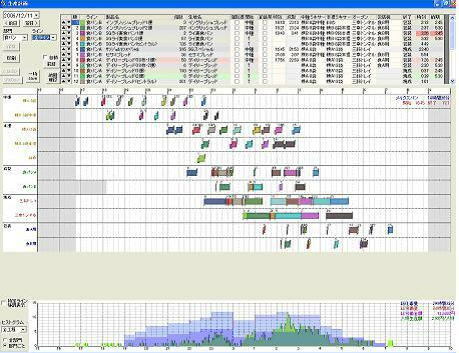 As the “Ad libitum” overlays to detailed histogram the change of work quantity and the supply labor quantity in the monitor, a planner is able to judge the excess and deficiency of a labor at a glance. As the production order can be changed easily, a workload is adjusted by the combination of work and the labor quantity and work quantity can be matched. This factory is composed of 3 lines of a divider, HM, and AD and a vertical axis is time and a horizontal axis is a worker number. 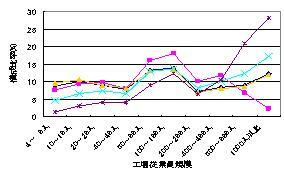 The pink part is the change of the job quantity for each after one minute based on production command. The supply labor quantity of the blue part is shown with the number of persons. The place where job quantity and regular worker overlapped is changing in gray color. The worker number of the green part of the right histogram becomes needed every time at the time of the production of a left Gantt chart, if the divider line is taken as an example. All the necessary worker numbers that combined A, B, C line are shown with a pink part. Accordingly a blue part increases when labor force is supplied excessively. If it adjusts between lines not to an independent line like this, it can decrease the labor force of the whole factory. Ad Libitum has been developed in mainly food industry. Compare with electric goods, car and chemical plants, majority of food factory has more complicate and more obscure condition of production factors which experience and scent exist remain still now. There few scheduler (production plan software) works well in a complicate food factory especially bakery. Many backbone system such as ERP (Enterprise Resource Planning) and MRP (Material Requirements Planning) state that this system has a production management function, however these system has ingredients control function and products stock control function at most. If they have a schedule function, almost of their scheduler are not enough to use in a complicated food factory. MES inform business data from business system like ERP to production site, and receive production data from production site. MES become more and more important as not only for factory (production site) but also information system between management and factory. So far isolated data in production site are scattered in even same factory, there is no system, which connect smoothly between business system and factory system. MES adjust production order which made in business system to production site level namely what is made, how much. 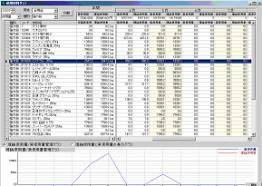 Reverse data such as actual result, progress data in production site are informed to business system through MES. That is EMS performs to connect smoothly between backbone system and production site. 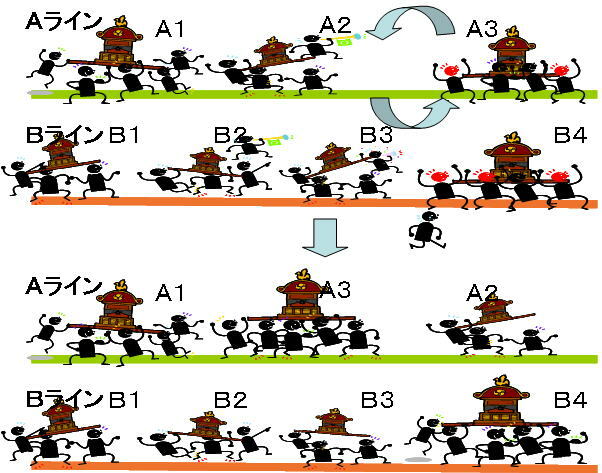 In order to manage the complicate production, calculation by hands is the limit of capacity. Integration by MES support human skill and knowledge, and realize to use more efficiently the resource such as facility, labor, ingredients. Ad libitum correspond to MES certainly. In case of more than one factory, the MES of ad Libitum can be build efficiently by each ad libitum in individual factory is connect mutually. If you have some questions and/or interests in ad Libitum, please contact us feel free. flour, Beverage, Chemical products, Cardboard container, Glass container, Concrete, etc. “Ad Libitum” can be easily customized for almost all customers.